Friday, I needed some instant gratification. After not touching my machines for a week, I needed to sew something--anything. I wanted to go shopping and buy some new shirts, but this ready to wear fast won't let me. I had been feeling yucky--sore throat, stuffy nose, headache. I had run to Joann's to get some serger thread on sale--4 cones for $5 plus 15% off! Youngest Son's school was having a their Cafe day, and I had promised I would try to make it. However, I was feeling really bad and left Joann's in a cold sweat. I decided to pick up a sandwich for him at Subway and drop it off, since I told him I would bring him something special. Skate Nights. I'm not sure if I want this guy learning to be more persuasive, but it is probably better than the temper tantrum with he doesn't get his way. Once he was dismissed for lunch and I gave him his sandwich and a hug and kiss (yes, I gave him a hug and kiss in front of his friends and everyone in the lunch room! ), I went home. I decided to go ahead and print the Maria Denmark Fee Kimono Tee that has been sitting in my computer waiting to be printed and sewn. I'll be honest, I have not sewn anything from her before, but I really liked the look of the kimono tee. The pattern and instructions are all in one 20 page pdf file. The pattern itself is 12 of those 20 pages. I printed it up, making sure not let my printer adjust the size, and taped it together. I was so happy to have a two piece pattern! I scanned the directions and saw that it does not include seam allowances. I wrote that on the pattern. I had planned to add them before cutting, but I was on a roll. Luckily, I remembered before cutting the fabric. I had a couple different fabrics in my stash that I was considering or this tee. 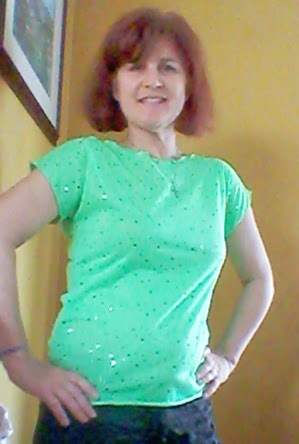 I finallly decided to use this lime/neon green with sparkly sequin looking things that I bought at the Joann's Red Tag section during a half off sale, plus a 25% coupon. I had a couple yards, but it is too much to make a dress. I think this ended up being about $2 a yard. However, while getting that, I started looking at some of my other knits and wadders with enough to salvage. 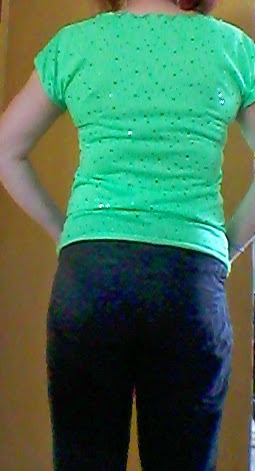 I couldn't find the other possible wadder that I wanted to salvage/refashion, so I grabbed by sparkly neon green. I used an older rotary cutter blade because I was a little anxious about how the sparkly neon spots might react to being cut. It worked pretty well, but I cut the missed sections with my paper scissors to be safe. I added a pinky width to the neck and side seams and two fingers to the sleeve and bottom hems. Once everything was pinned about an inch in from the seam lines, I set up my serger with brand new thread and serged away. The stitches went together perfectly. There were no problems with the sparkly sequin things. I then decided I wanted to be really lazy and adjusted my serger to do a narrow rolled hem. I left the extra length and set the differential so that I would have a little waviness and went to town. An hour after I had come home from Youngest Son's school, I had a new Maria Denmark Kimono Tee! Now for some reviewing. This tee is made with negative ease. I used a knit with very little stretch. I don't think there was any lycra. Why did I buy a knit without lycra?!?!? So the fit is a little snug. I also didn't really hem the sleeves or the bottom. According to Middle Son, I need to hem the neck. He says it looks funny. I'll give it a few wearings to decide. All in all, this pattern is a winner. I will definitely make more of these, but with lycra. I might even hem them. I have this file too! You are giving me the motivation to sew it up. Lovely color. Thanks, Annie. I definitely recommend making sure you have lycra in your fabric. There isn't much stretch and I realized after wearing it that I was feeling self conscience. The family has also determined that I should "finish" the top. They don't like the rolled hem. So cute. I love that tee. It's my go to when I have 1 yard of knit! Thanks, Nakisha. I have a bunch of 1 yard or less remnants. I need to be monitored like a child in the candy aisle when I walk by the remnants! It looks really pretty. I hope you feel better soon. Thanks, Vanessa. This is definitely a quick sew. Even faster now that the pattern is printed, assembled and cut. I just love quick and easy projects, especially with green and sequins! Green is so hard to photograph. This looks like a shamrock shake here, but not so much in person. I think this is my first ever sequinny item ever! Lovely! Instant gratification projects are my favorite. :) I like to have an ton of them them ready to go. Will be adding this pattern to the stash! In the pictures, the wavy neckline look cute!!! Thanks, Vicki. I like some of the TNT to be on thicker paper or tag board and hang them on wire hangers. This makes them easy to grab and easy to put away. Thanks, Sarah Liz!! Congratulations again on your 2nd Liebster! I just bought fabric on Etsy for a cardigan. I've been wearing it with my favorite denim jacket that is getting too warm. Great minds think alike. I've been following you on Bloglovin" for quite a while, but sometimes miss you. I decided to add you to my Google Circles to make sure I don't miss your posts.